We received a number of notes in response to our inaugural issue of Caltech magazine—some complimentary, others critical. All will help us plan for this magazine’s future, and for that we are grateful. Here are a couple of examples. I just received my copy of the Spring/Summer 2017 Caltech magazine and I must say it is impressive. I really enjoyed the dual focus on people and science. I receive so many periodicals, and it is difficult to find the time to read them thoroughly. Caltech magazine was read from first to last page within the first day of receipt. I think this is a record (at least for me). Please continue the outstanding work! I have just read through the recent edition of Caltech magazine. I enjoyed your “Welcome” discussion of the magazines that have come from Caltech through the years. I particularly appreciated and used the magazine in its previous format, E&S, after I graduated in 1964. And later, as a faculty member at UC Davis, I was able to use some of the E&S stories as assignments in my classes—general (science) interest articles for some freshman seminars and more specifically biologically related articles for upper-division students in biochemistry or physiology classes. In your new format, there is nothing that I can use. There are great pictures. There is a lot on the Caltech community. There is a big article on brain studies, but it is about the people doing the studies, not the studies themselves or what has been discovered. “Gut(-Brain) Reaction” is a subject of real interest at Davis, but one page is not. I understand that this is a magazine designed to elicit pride in potential donors, but I hope that we can learn more about ongoing research at Caltech. I would like articles that I can show my students. After all, they might be potential Caltech grad students. 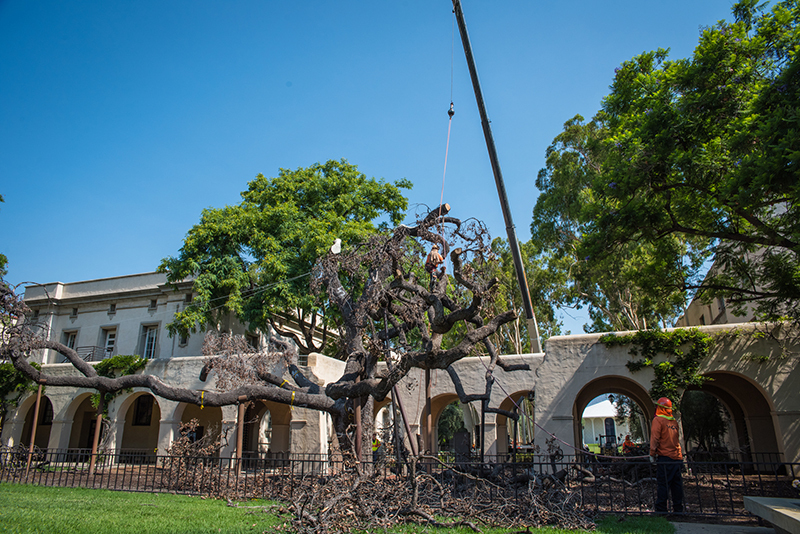 On July 11, workers dissected Caltech’s 400-year-old Engelmann oak, which died last year. Portions of the tree were salvaged for research and other uses. Thank you so much for including the article “The End of the Oak” in the latest issue of Caltech magazine. That tree held special significance to our family. In 1970, when I was accepted into the first class of women at Caltech, my father—Ching Yuen Hsiao, who graduated from Caltech in 1926 as one of the first Chinese students at the Institute—could not have been more proud to have his daughter attend his alma mater. It was not until I graduated in 1974 that my father was able to make the trip to Pasadena, 48 years after his own graduation. When I gave him a tour of the campus, it was quite a shock to both my father and me that all of my father’s former professors (Millikan, Gates, Bridge) were now buildings! We walked and walked, and finally we came to the oak tree. Here my father stopped as he mentally returned to his college years. “Yes,” he said, “this tree was here when I went to Caltech. I remember this tree.” We took pictures of the tree that day, and though those pictures and my father now are long gone, I was so happy to read your article. I so appreciate reading about the care the Institute has taken to nurture and maintain that tree for as long as it has, and on my next trip to Pasadena, I’m sure to feel a twinge of sadness looking at the spot where the oak once stood.